선산은 신라에 불교가 처음 전파되었을 때와 인연이 있는 곳으로 거대한 석탑이 많이 남아 있다. 이 일대의 경작지에서 연꽃무늬가 새겨진 막새기와를 비롯하여 많은 기와조각과 토기조각 등이 발견되어 이 부근이 절터였음을 알 수 있다. 현재 이 탑은 약간의 손상이 있으나 비교적 완전한 형태로 남아 있으며, 통일신라시대의 전형적인 석탑양식인 2단의 기단(基壇) 위에 3층의 탑신(塔身)을 올린 모습이다. 기단부는 아래층 기단 가운데돌에 모서리기둥 2개와 가운데기둥 3개, 즉 한 면에 5개의 기둥이 새겨져 있다. 위층 기단 가운데돌에는 모서리기둥 2개와 가운데기둥 2개가 새겨져 있다. 탑신부의 1층 몸돌은 남쪽에 불상을 모시기 위한 방이 설치되어 있고, 방 입구에는 문을 달았던 동그란 구멍이 남아 있다. 지붕돌은 아래받침과 지붕 추녀, 윗면 층단 모두 전탑의 양식을 모방하고 있다. 꼭대기의 머리장식은 모두 없어지고 머리장식을 받치던 노반(露盤)만 남아 있다. 이 탑의 아래층 기단에 가운데기둥을 3개나 새긴 것은 초기적인 양식이라 할 수 있는데, 몸돌과 지붕돌의 구성방법은 다소 시대가 떨어지는 면을 보여준다. 이와 같은 양식은 구미 죽장리 오층석탑(국보 제130호)에서도 볼 수 있는 것으로 일종의 모전석탑 계열에 속하는 유형이다. 돌의 구성에서도 규율성을 잃지 않고, 기단부의 구조와 각 부를 짠 수법으로 보아 석탑의 건립시기는 8세기경인 통일신라 전기로 추정된다. 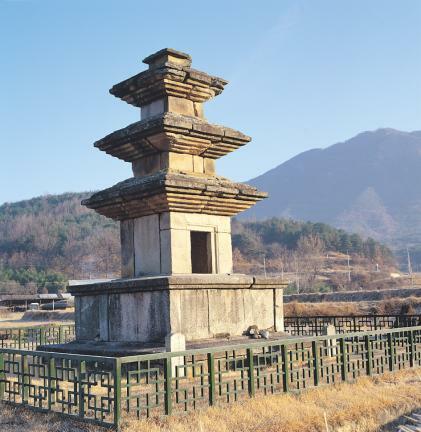 Many huge stone pagodas including this three-story stone pagoda remain around Seonsan, one of the places where Buddhism was introduced earlier than any other place during the Silla Era. Many relics including fragments of roof tiles, pieces of earthenware, and antefixes engraved with lotus patterns have been discovered around this area, proving that this place is the former site of a temple. 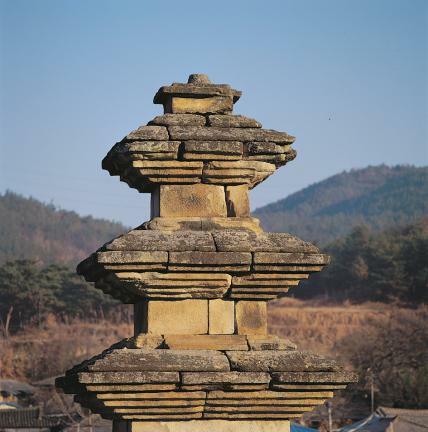 This pagoda remains in relatively complete state with slight damage and consists of the three-story main body and two-layer stylobate as a typical style of the stone pagodas built during the Unified Silla period. 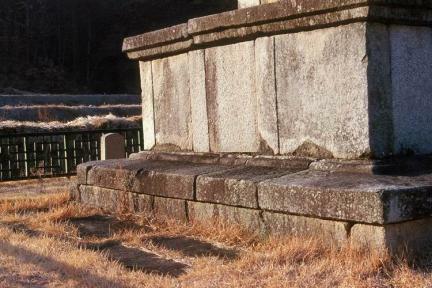 The stylobate is engraved with pillar patterns; each facet of the middle stone of the bottom layer is carved with five pillar patterns – two at the corners and three in the middle -- on each facet; the middle stone of the upper layer is carved with two pillar patterns at the corners and two pillar patterns in the middle of each facet. 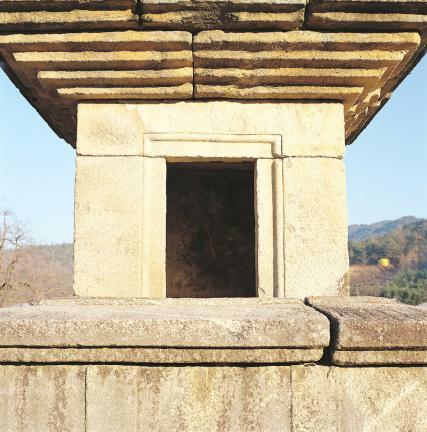 A niche enshrining a Buddha statue is installed on the southern part of the core stone of the first story, with round holes to fix the door at the entrance of the niche remaining. The roof stones including the cornices, eaves, and tiered-upper side were built by imitating the brick pagoda style. 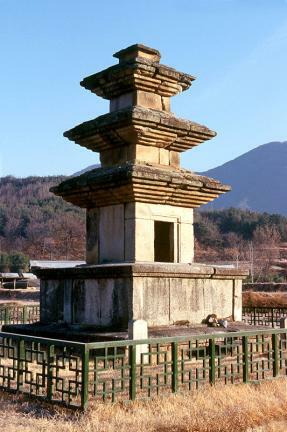 Of the upper part of the pagoda, all the finial parts are missing, and only the finial base remains. 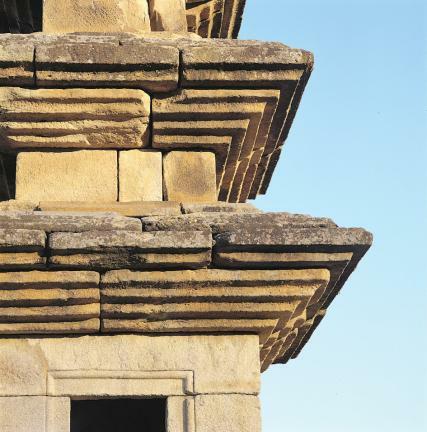 The three pillar patterns engraved on every facet of the bottom layer of the stylobate are believed to be characteristic of the style of the early stage of the construction history of the stone pagodas. Moreover, the composition of the core stones and roof stones seems a bit behind the times. 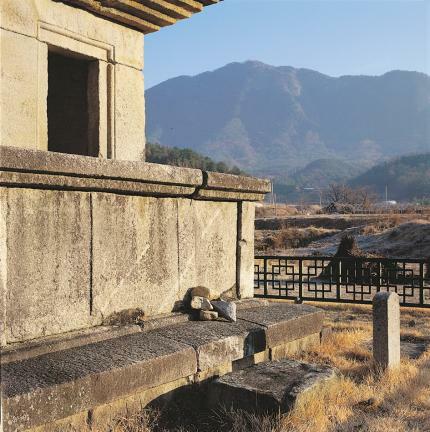 These kinds of style are similar to the Five-story Stone Pagoda in Jukjang-ri, Gumi (National Treasure No. 130), which is regarded as a kind of brick pagoda. 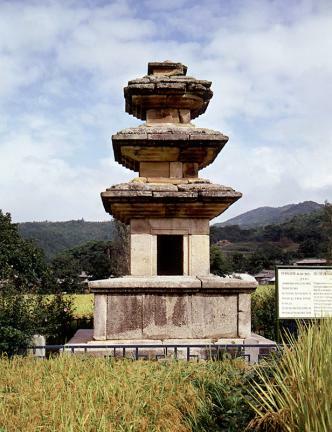 The pagoda is assumed to have been built around the 8th century of the early Unified Silla period, judging from the well-arranged composition of stones, structure of the stylobate, and general structure of the pagoda.